Stainless steel materials are used in a wide variety of applications because of their enhanced corrosion resistance, high temperature oxidation resistance, or strength. Stainless steel’s unique properties are derived by adding alloying elements, principally chromium and nickel, to steel. Typically, more than 10% chromium is required to produce stainless steel. There are four general grades of stainless steel, which are typically classified according to their material properties. Listed below are laser welding considerations and requirements for each grade. The 300 series of stainless steel is generally austenitic stainless steels. These stainless steels are used in applications requiring corrosion resistance and toughness. The 300 series stainless steels can be found in a wide range of applications in petroleum, transportation, chemical, and power generation industries. These stainless steels are particularly useful in high temperature environments. This series of stainless steel is suitable for both pulsed and continuous wave (CW) laser welding. Laser welding stainless steel provides slightly better weld penetration depths and increased weld speeds when compared to low carbon steels due to the lower thermal conductivity of most austenitic stainless steels. The higher speeds from laser welding are also advantageous in reducing the susceptibility to corrosion caused by the precipitation of chromium carbides at the grain boundaries. Chromium carbides precipitation can occur when the heat input is too high during the welding processes. The well-controlled and repeatable heat input from the laser welding process reduces the width of the heat-affected zone, thus reducing the region that may be susceptible to pitting and corrosion in the future. 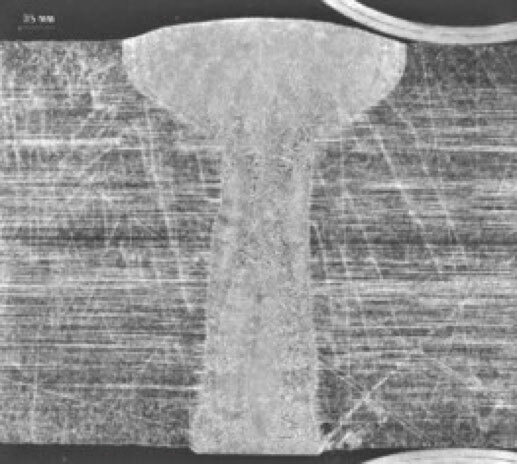 An additional benefit from laser welding these grades of stainless steel is reduced thermal distortion and residual stresses when compared to conventional welding techniques. This is especially important for stainless steels that have a 50% greater thermal expansion than plain carbon steels. NOTE: The use of free-machining grades should be avoided because these stainless steels contain sulfur that can lead to hot cracking during laser welding. The ferritic 400 series of stainless steel typically have very little to no nickel and do not possess as good weldability when compared to the austenitic grades. Laser welding the ferritic stainless steel grades in some cases, impairs joint toughness and corrosion resistance. The reduction in toughness is partially due to the formation of coarse grains in the heat-affected zone and martensite formation, which occurs in the higher carbon content grades. The heat-affected zone may have a higher hardness due to the fast cooling rate, which increases the brittleness. The martensitic 400 series of stainless steel is more challenging to laser weld than the austenitic and ferritic grades. Laser welding high carbon martensitic grades (> 0.15% carbon) can cause the material to be brittle in the heat-affected zone. If martensitic stainless steel with carbon contents above 0.1% have to be welded, than use of an austenitic stainless steel filler material can improve the weld toughness and reduce the susceptibility to cracking, but cannot reduce the brittleness in the heat-affected zone. Pre-heating the material before welding or tempering the material at 650-750°C after laser welding may be considered to reduce the brittleness in the heat-affected zone. Duplex stainless steels is a mixture of austenitic-ferritic stainless steels. These stainless steels are characterized by a two-phase microstructure containing austenite and ferrite. Generally, the volumetric fractions of austenite and ferrite are roughly equal. The main alloying elements are chromium, nickel, and molybdenum. Duplex stainless steels are usually also alloyed with small amounts of nitrogen. Duplex material is generally weldable with good results. Because of the variety of materials available, testing is encouraged before finalizing a design. The shielding gas in welding stainless steel fulfils two important roles. First, to provide protection against excessive oxidation and second, to reduce plasma formation. Limiting the formation of plasma is more critical when using a CO2 laser to weld stainless steel. There is an interaction between the wavelength of the CO2 laser energy and the ionized cloud gas above the weld, which reduces the laser penetration and can affect the weld quality and repeatability. Fiber laser welding, which is a different wavelength than CO2, does not suffer from plasma formation. However, power levels of more than 10 kW may generate extensive plasma formation leading to process and weld quality problems. The most frequently used cover gases are helium (He), argon (Ar), and nitrogen (N2). 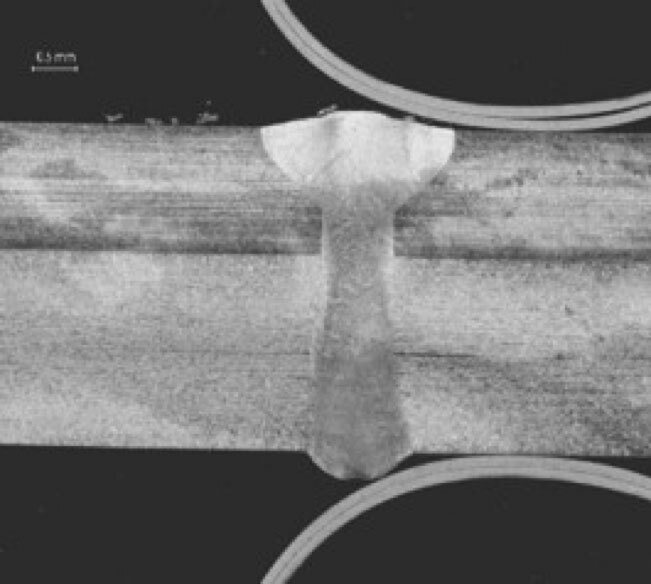 The shield gas is often directed and centralized on the laser-material interface with an auxiliary tube directed towards the trailing edge of the weld were the material is still hot. Helium shield gas is most suitable for CO2 laser welding due its ability to suppress plasma formation. Helium shield gas can be used when welding stainless steels with a fiber laser. However, due to Helium’s low mass, the shield gas flow rates are generally higher to provide effective protection from the atmosphere, especially for open or three-dimensional components. The higher flow rate coupled with high cost of helium makes the use of less expensive gases more attractive, i.e. argon or nitrogen. Regardless of which shield gas is used, if the gas flow is too low, the weld surface will characteristically have a heavy oxidized weld surface. When the gas flow is too high, it causes excessive weld undercut, porosity, and disrupted weld bead. When through welding stainless steel, a shield gas is also required to produce acceptable bottom bead (bottom side) weld surface. Note: For both top and bottom bead, nitrogen should not be used as a welding shield gas for austenitic stainless steels alloyed with titanium and niobium. In this special case, nitrogen forms nitrides with the titanium (Ti) and niobium (Nb), so that there is less free titanium and niobium available to prevent chromium carbide formation and corrosion. Modulated parameters (peak power, pulse energy, pulse frequency etc. Table 1 summaries different types of shield gases and flow rates for the different grades of stainless steel when using a fiber laser for the welding process. Using these flow rates and shield gases may improve the weld process repeatability and quality. l/min Nitrogen has the same effect as carbon when working with ferritic stainless steels. It increases the quantity of martensite in the weld metal and increases the brittleness of the weld. Table 1: Different shielding gases that can be used for the top and bottom beads during laser welding with fiber lasers. If you are considering a laser system for a stainless steel application, please feel free to contact us at lds.sales@primapower.com. There is a great deal of expertise and experience available for your assistance. If you found this article interesting, you may also want to read the following articles from Prima Power Laserdyne.